Roger Federer impressed the Centre Court crowd with royalty watching in his second round match, but since then, escaped from a 2 sets to love deficit against Benneteau, and had to overcome back troubles against Malisse. However today was another display of brilliance from the Swiss maestro, as he cruised to a 6-1 6-2 6-2 win over Mikhail Youzhny in the Wimbledon quarterfinals on the 4th of July. Plenty of royalty witnessed the masterclass performance from the Swiss, including Prince William of Britain with his wife, Duchess of Cambridge Kate, “the Rocket” Rod Laver, and Andre Agassi with wife Steffi Graf. Federer was never in trouble, as he raced out to a 4-1 lead in the first set before a brief rain delay. 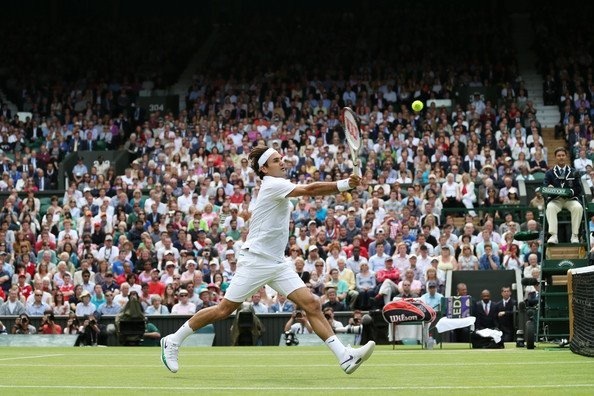 There was no stopping the Swiss freight train, as the first set was over shortly after, and after 1 hour 32 minutes, with a sharp angled backhand volley winner, Federer was thru to the semifinals of Wimbledon once again. It marks the first time since 2009 reaching the final four, and now an Open Era record, 32 grand slam semifinals, breaking Jimmy Connors’ record of 31. Everywhere Federer goes and in every match, he is seemingly breaking more records and creating new history. The Swiss maestro also continued his aggressive net play, winning 24 of 34 points at the net to go along with 25 winners. Federer will take on Novak Djokovic in the semifinals on Friday (televised live on FF07tv).